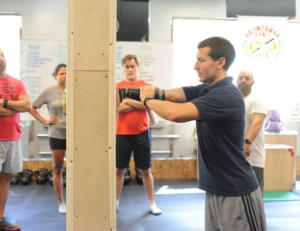 Free Workshop – Shoulder Pain & What To Do About It! Why: -Do you have shoulder pain that limits your quality of life? -Do you wake up at night because of your shoulder pain? -Do you have trouble with just normal daily activities like getting dressed and showered? -Are you afraid your pain will get worse if you don’t do anything about it? If you answered yes to any of these questions or know someone that would answer yes, then this workshop may be a game changer! Shoulder pain can be an unrelenting problem that just doesn’t seem to go away. It can drain you of your energy and can take your focus away from enjoying your life as you should be. It can cause many sleepless nights which can affect your overall health. All of this can lead to stress, frustration, depression and changes in your life that prevent you from doing what you want. Even worse, it can become a bigger problem if ignored. How to Register: This workshop will be limited to 15 people so be sure to register now before it fills up! It’s easy to do and it’s FREE! Just call Greg at (845) 419-1432 to reserve your seat. When: Saturday, November 11 from 10:00-11:00 am. This clinic is FREE. Where: Personal Strength & Training. 17 Glen Pond Drive Suite 6, Red Hook, NY 12571. Thursday March 5 from 5:30pm-7:30pm, 2015. Why: Stride/Gait analysis can pick up subtle biomechanical flaws in your gait that cause pain or dysfunction, which leads to common running injuries such as plantar fasciitis, shin splints, calf pain, hamstring strains, patella femoral tracking problems, hip pain, IT Band syndrome, and back pain. In this clinic Dorothy Hamburg & Rob Sobel will assess how you run on the treadmill and let you know if you have any flaws in your gait that may be causing you pain, dysfunction, or put you at risk of injury. Who: The team of: Dorothy Hamburg, M.S. –– Exercise Physiologist, ACSM Clinical Exercise Specialist and owner of Personal Strength & Training, Inc., Red Hook NY and Rob Sobel, — Certified Pedorthist and Owner of Sobel Orthotics and Shoes in New Paltz, NY. When: Thursday, March 5th from 5:30-7:30 pm. This clinic is FREE. How Our Clinic Works: This clinic provides free video treadmill analysis and interpretation. Each person who attends will have a 15 minute block to have their running assessed on the treadmill. While 15 minutes is not enough time to do a full evaluation — we will give each person some insight into their gait/stride and how it affects running performance. What to Bring: Your running shoes and running clothes. Please do not wear your running shoes outside. The salt and snow can destroy the treadmill. (New Date) Thursday October 3 from 6pm-7pm, 2013. Why: Back pain affects almost 80% of the American population. Typically acute and chronic pain is due to improper mechanics of the spine as well as weak or non-functioning stabilization muscles of the spine. There are many causes to these issues and they can range from sitting too long, exercising incorrectly, injuries and stress. In our low back and core clinic you will learn more about your spine and what you can do to improve its’ function. You will leave our clinic having a better understanding of how your spine, back and core muscles function together to keep you healthy, active and pain-free. Who: The team of: Dr. Barbara Blisko –– Chiropractic & owner of Healing Arts Center of Red Hook and Dorothy Hamburg, M.S. –– Exercise Physiologist, ACSM Clinical Exercise Specialist and owner of Personal Strength & Training, Inc., Red Hook, NY. When: (new date) Thursday, October 3rd from 6-7pm. This clinic is FREE. What: (to bring) Comfortable clothes. We have a changing room. Where: Personal Strength & Training, Inc., 17 Glen Pond Drive, Red Hook, NY 12571. 845-876-1191. Cost: FREE. However, space is limited to 15 people. Call 876-1191 or email dorothy at dorothy@PersonalStrengthandTraining.comto reserve your spot. Thursday August 23 from 5pm-7pm, 2012. Why: Video Stride/Gait analysis can pick up subtle biomechanical flaws in your gait that cause pain or dysfunction, which leads to common running injuries like plantar fasciitis, shin splints, calf pain, hamstring strains, patella femoral tracking problems, hip pain, IT Band syndrome, and back pain. In this clinic Dr. Ness & Dorothy Hamburg will look at video of you running on a treadmill and tell you if you have any flaws in your gait that may be causing you pain, dysfunction, or put you at risk of injury. Who: The team of: Dr. David Ness –– Certified Chiropractic Sports Practitioner® (CCSP) & Active Release Techniques Therapist (ART) and Dorothy Hamburg, M.S. –– Exercise Physiologist, ACSM Clinical Exercise Specialist and owner of Personal Strength & Training, Inc., New Paltz NY. When: Thursday, August 23 from 5-7 pm. This clinic is FREE. What: This clinic provides free video treadmill analysis and interpretation. Each analysis will provide a brief synapsis of any structural or biomechanical concern. Space is limited. Call 255-1200, visit Dr. David Ness on Facebook, or email us at mail@drness.com. Where: Performance Sport & Wellness, 3 Cherry Hill Road, New Paltz, NY 12561. 845-255-1200. Thursday March 8th from 6pm-7pm, 2012. Why: Why not? This will be an informal and relaxed clinic. Where: Performance Sports and Wellness, 3 Cherry Hill Road, New Paltz, NY 12561. 845-255-1200. Cost: FREE. Space is limited to 15 women. You will need to reserve your space. What to Bring: Your bicycle front wheel with tire and tube. If you have tire changing levers, a spare tube and a pump, please bring them. Be sure to clean your wheel before hand. You might also want to bring a small hand towel. Contact: Dorothy Hamburg at Personal Strength & Training to reserve your spot or if you have any questions. Dorothy can be reached at dorothy@PersonalStrengthandTraining.com or 845-876-1191. Thursday February 16th from 6pm-7pm, 2012. Why: Not all runners are created equally. And neither are your training heart rates. Knowing how to use the appropriate method for determining your target Training Heart Rate Zones will make a significant difference in your workouts. Having a clear understanding of your personal lactate and anaerobic thresholds can make a difference between achieving your goals and falling short during a race. This clinic will go over several common methods for calculating your target training zones and improving your performance during the off-season. Cost: FREE. Space is limited to 15 athletes. You will need to reserve your space. Thursday October 21st from 5pm-7pm. that could lead to common running injuries like plantar fasciitis, shin splints, calf pain, hamstring strains, patella femoral tracking syndrome, hip pain, IT Band syndrome, and back pain. As well, Stride/Gait analysis can be used to help athletes run more efficiently and to prevent an injury before it happens. This workshop will be held at Performance Sports & Wellness, 3 Cherry Hill Road, New Paltz, NY, 12561. 845-255-1200. This workshop is Free but is limited to 10 athletes. Pre-registration is required to reserve your time on the treadmill. Call 255-1200 or email Dorothy Hamburg for more info. Contact: David Ness at Performance Sports & Wellness for any further details on this clinic or Dorothy Hamburg for any questions. Dorothy can be reached at dorothy@PersonalStrengthandTraining.com or 845-876-1191.